Chuck E. Cheese no longer your Daddy's Chuck E. Cheese, is now "hip"
Following two decades of embarrassingly square attempts to interest children in Chuck E. Cheese, the skeeball-and-pizza-equivalent emporium has finally recognized the pressing need to rebrand its mascot for today's youngsters, whose enjoyment of arcade games and junk food depends mightily on every aspect of their hip, media-savvy identity being pandered to by an anthropomorphic mouse. And so it's out with the old—specifically, longtime mascot voice Duncan Brannan, who helped to transform the original, "joke-telling, sometime off-color New Jersey rat" into a more "mainstream" evangelist for the word of Jesus Christ, apparently, before he was recently replaced by parent company CEC Entertainment without warning. In fact, Brannan made the discovery that he'd been fired only after hearing the new promotional jingle "Chuck's Hot New Single" and realizing that, instead of his own Borscht-belt-tinged-with-the-blood-of-the-Lord lilt, he was listening to the adenoidal snarl of Bowling For Soup singer Jaret Reddick—a new Chuck E. Cheese for a new, pop-punkier day, as that is the sort of thing today's kids like, according to a boardroom of desperate pizza executives. 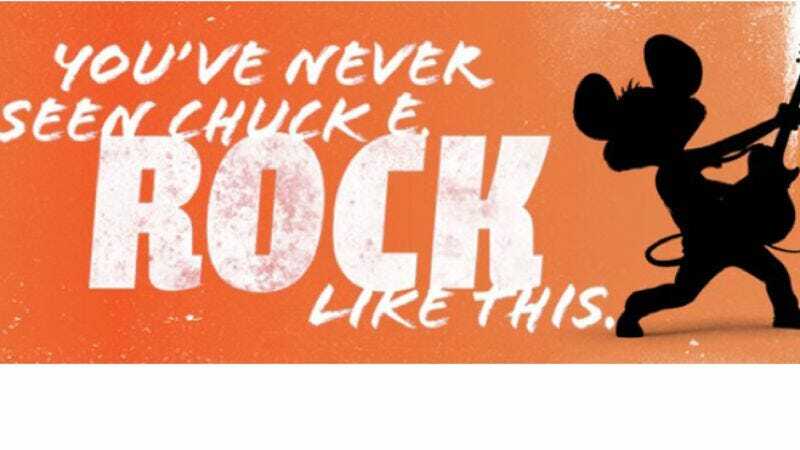 Reddick's voice is now complemented by Chuck E. Cheese's new image as a "a hip, electric-guitar-playing rock star," as seen in the ad above that you should definitely not show your parents, as they will no doubt fall to their knees wailing about America's rapidly waning moral center. After all, they'll have plenty of opportunity to rock back and forth moaning the word "Eisenhower" once the campaign officially launches on Thursday, its success ideally preventing CEC Entertainment from having to learn anything about today's kids and what they're actually into. "He's a hip, dubstep vampire Twitter," someone will sputter, before leaping to their death.